I am a huge Snoopy fan. I fell in love with Snoopy as a kid. A Charlie Brown Christmas is essential for me this time of the year. A few years ago after Thanksgiving, I received a text from my niece, "Auntie, Charlie Brown is about to come on." I replied, "I know. I love my Snoopy!" It went downhill from there because my niece went to the forbidden topic. She replied, "Too bad about your Snoopy Sno Cone Machine." Why open a wound that has not healed?! You are thinking that not all of my childhood Christmases were great. True, true. Imagine if you will, a bright-eyed seven-year-old going through the Sears toy catalog. Never before had she requested a specific gift from her parents - for she was too gracious for that sort of thing. However, this year, one item called to her and yearned to be hers -- a Snoopy Sno Cone Machine. This young girl adored Snoopy. Who could not love Snoopy? There would be no Charlie Brown without Snoopy. Snoopy was cool. Even Lucy was jealous of Snoopy's coolness. That year, all she circled in the toy catalog was a Snoopy Sno Cone Machine. Christmas Day arrived and a box resembling the size of a Snoopy Sno Cone Machine lay in her section of gifts on the sofa. Oh what joy, what disappointment! It was not a Snoopy Sno Cone Machine, but instead a Mr. Planter's Peanut Butter Maker. What Grinch / Ebenezer Scrooge would do such a fiendish thing! Mr. Planter was no Snoopy. He was not even a cartoon. He just danced around with a top hat talking about peanuts. That year, a little girl's heart received a dent that remained for years. Why? Why? The next Christmas she hoped redemption would come and a Snoopy Sno Cone Machine would be hers, no such luck. She despised the two-feet Mr. Planter monstrosity! What type of forced child labor is this? If I want a PB&J, I have to make my own peanut butter. She had to draw a line in the sand. Instead of using it to make peanut butter, she used it to sharpen crayons. Evil contraption haunted her sleep and put a dark cloud over Christmases to come. So much so, that when she became an aunt, each Christmas she would tell the tale of no Snoopy Sno Cone Machine. As an adult, she found the strength to confront her mother over the Mr. Planter incident. Her mother put on a sincere face and said that she could not find a Snoopy Sno Cone Machine. It was sold out everywhere. But why Mr. Planters?! The mother said in a practical voice that only mothers use: "You were a picky eater and loved peanut butter and jelly sandwiches. So I thought it would be a good alternative." This answer did not lessen the blow to the daughter's wounded heart. The daughter asked, "Then why not the next Christmas?" The mother responded that she did not think her daughter would want it by then. The daughter began to wonder if what her older sibling said was true. Was she adopted? Everybody else received what they wanted for Christmas? Was this yet another slight against the middle child?! It was bad enough there were no baby pictures of her. So the daughter, now aunt, relayed the story to her nieces and nephews, on how grateful they should be that they had an aunt that loved them enough to get them what they wanted. If patience is a virtue, this daughter exercised it. 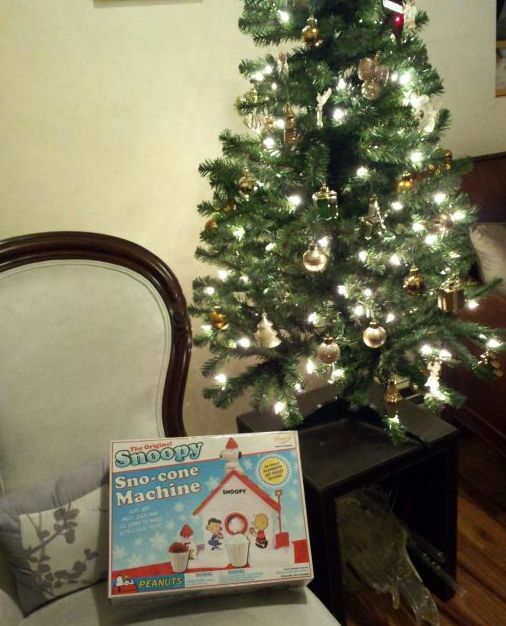 Twenty Christmases after requesting a Snoopy Sno Cone Machine, while repeating the tale to the nieces and nephews she noticed a box under the tree with her name. Jokingly, she said, "The only thing that would make this perfect is if this is a Snoopy Sno Cone Machine." Wonder of wonders, miracle of miracles! On her 27th Christmas, her younger sister found a Snoopy Sno Cone Machine. What joy! Excited the aunt took her nieces and nephews to the kitchen to show off the long waited for snow cone maker. It took about 10 minutes to make a sno cone, so one by one the nieces and nephews left the kitchen. They could not wait that long. But wait, do not cheer. Tragedy stuck in the form of an evil older sibling. A couple of years after finally receiving my Snoopy Sno Cone Machine, my niece called. "Auntie, I have bad news for you. Mommy threw out your Snoopy Sno Cone Machine." NOOOOO!!!! During law school, I moved around so I left Snoopy at home. My niece, sensing my anxiety offered, "You can play with my SpongeBob Snow Cone Machine." Her aunt protested, "SpongeBob is no Snoopy!" My niece, "Auntie you just have to get over this because Snoopy is gone" (holding back tears as I write this traumatic moment). My sister did this because she knew I loved Snoopy. This was no accident. She was just jealous that her favorite cartoon character did not have a toy. If we were still kids, I would have told on her. Instead, I did the mature adult thing. Each Christmas I get her kids a loud noise-making gift, with extra batteries. It is my revenge for the death and loss of Snoopy. I heard the karaoke machine caused her much discomfort. Muuuuahh! !